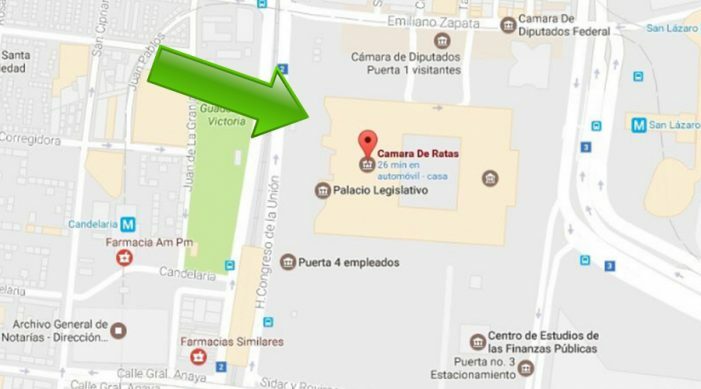 Pranksters changed the name of Mexico’s lower house of Congress (Cámara de Diputados) to the “Chamber of Rats” (Cámara de Ratas) on Google Maps on Tuesday in the latest dig at the political class during a testing start to the year for the country’s government. The lower house, also known as the Chamber of Deputies, became the “Chamber of Rats”, using the Spanish word “rata,” which is also slang for thief in Mexico. “Our teams are working fast to resolve this incident,” Google Mexico said in a statement, explaining that place names on the online mapping service came from third parties, public sources and contributions from users. It was the second such attack in the space of a few days. Mexican media reported at the weekend that the presidential residence appeared as the “Official Residence of Corruption” on Google Maps before Google Mexico removed it from the map and apologized for “inappropriate content” created by a user. Mexico’s government has faced protests, road blocks and looting of shops since the start of 2017, when the cost of fuel jumped sharply on the back of a finance ministry decision to liberalize the market and end state-set gasoline prices. Allegations of corruption swirl constantly around the political class in Mexico. A 2013 Transparency International study showed that 91 percent of respondents felt political parties were corrupt or extremely corrupt. Some 83 percent took the same view of the legislature, the study showed. The credibility of President Enrique Pena Nieto was damaged by a conflict-of-interest row earlier in his six-year term when it emerged that he, his wife, and his then-finance minister had all acquired homes from government contractors. A government-ordered probe cleared all of any wrongdoing. Reuters is the news and media division of Thomson Reuters. Thomson Reuters is the world’s largest international multimedia news agency, providing investing news, world news, business news, technology news, headline news, small business news, news alerts, personal finance, stock market, and mutual funds information available on Reuters.com, video, mobile, and interactive television platforms.